This model, brought to you by Harvil, is one of the shortest tables on the market measuring in at just 4 feet in length. 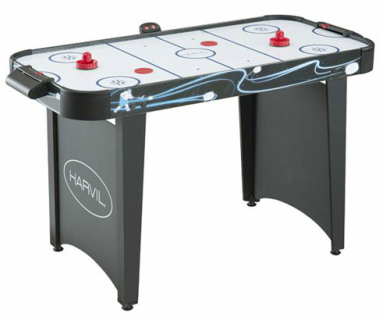 Most home model tables measure at 6-7 feet, so this is much more compact for younger children and small game rooms. It's smaller size wouldn't be suitable for adult play. It is equipped with an electronic blower that provides fast action, L-shaped legs and leg levelers, and an electronic scoring unit keeps track of who's winning throughout every match! This table is priced at about $130 US.